If you experiment strong background noises (S-5 to over S-9 on your S-meter) covering most of your bands, signals beating at a high rate, interferences occuring only at daytime or a very strong signal in a narrow bandwidth of a few dozen kHz, you are more than probably face to man-made signals, radio frequency interferences or RFI, the famous QRM. If you locate immediately the gulty device it is fine (i.e. a transformer, a battery charger, a power line) but generally these RFI come from the outside, another appartment or a system installed in your neighborhood that you cannot eliminate. But in some rare occasions that noise can be natural. Before giving up all hopes to find a solution, I first suggest you to go "snooping" with a portable receiver around your neighborhood (in your stairs and in your streets) equipped with a whip antenna to try to find the source of the noise to attack it with vigor ! If you prefer to request the help of a specialized company (see your local administration for addresses) know that such a service is rather expensive; in Europe it costs about 350 euros for one measurement (1 spot) or to made a record during one night, the technical report being included. Measuring a QRM in radio amateur bands is more expensive as more difficult to identify and requesting a DSP, but this service gives often positive results. Once the QRM identified, you can ask to the owner of the parasitic device to reduce the source of noise at his charge. In case of refusal, the next step will be the legal appeal using your technical report as proof. If the noise persists one or several kilometers away from your QTH, you are probably face to a more general problem : in the worst case the noise may comes from a natural source, it is QRN, static, and you probably could not suppress it at all. In the second case this noise is well man-made and probably generated by a powerful system widespreading RFI in all your area. If you have more sophisticated equipements like a spectrum analyser you could analyse these unsollicited signals to measure theirs periods and harmonics, and deduce the kind of device producing such noises. In the cases you are not able to remove the source of QRM, after have done some measurements try to contact the competent authority (probably your FCC or Telecom administration) or your local radio club to get some help and trying to find a bypass or maybe a solution to suppress this man-made noises. At last in matter of private right, know that going before the courts to solve such an affair is not necessary the best solution; that will cost you a lot (a minimum of 2500 euros) without certainty on the final decision, even if at first sight the law is your side. Bringing such affair before the courts can be interesting from your point of view only if you are owner of your home and that you decide to win whatever that may cost to preserve the tranquillity of your "electrical window" and ham activity. We will however not go further on this subject. You will find more information to a lawyer expert in such matters. If the RFI cannot be suppressed, as a last resort you will have to find a way to definitely "live" with it but without recording these unsollicited signals in your RTX. Name a few. Excepting changing of location for a quieter spot (electrically speaking), you can move your devices a few meters away or in another room to reduce this QRM as its intensity decreases by half when the distance double. If this solution cannot be applied for practical reasons, you can also install small chokes on all interfering wires but their performances are usually as poor as their price is low and they are not really efficient against powerful RFI emitters. You can also replace all your cabling system with a double shielded coax RG213. Disadvanges, it is tick (about twice as the RG8), more rigid, more expensive versus an ordinary coax (RG8 or RG58) and sometimes unapplicable due to technical or esthetical considerations. You can then place your gulty device in a Faraday cage. Although it is conceivable for a small transformer, that becomes unapplicable for a 17" display or a keyboard. If you are not living nearby a power line or another source of severe broadband RFI - for which I'm sorry to tell you there are no other solution than moving away -, in all other cases for which you cannot apply the simple rules listed above here is probably the unique and ultimate solution : install the MFJ-1026 Deluxe Interference & Noise Canceler; that could be your "miracle box" !I don't say it will remove all interferences you will hear, but surely most of them. This is not the only product available on the place and Timewave ANC-4 to name one is another challenger, working the same way and giving similar results. According various tests, the model provided by MFJ seems however simpler to use, cheaper, less touchy and includes an attenuator not available to its competitor. To be complete say that the early revisions of the MFJ unit may have had some problems, but later ones are definitely good devices knowing that MFJ invested quite a lot of engineering time to ensure that their product would work well. As far as I know, there is no connection between MFJ and Timewave. But I suggest you to check reviews of these products on eHam.net and other Hard-Core-DX for more information. I installed the MFJ-1026 unit recently and according my tests this device cancels quite well most interferences, dropping sometimes their intensity from S-9 to as small as S-1. 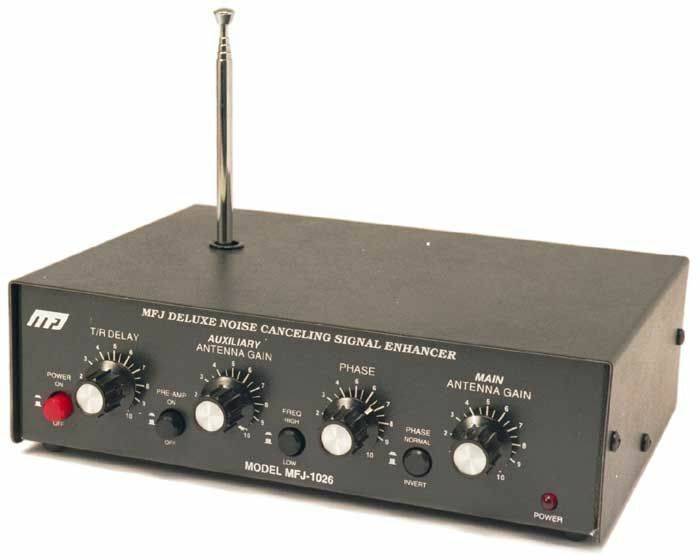 Very effective when installed properly, it works on all HF bands with a bandwidth of about 40 kHz. This unit looking as a miracle box, I have though it was a good idea to explain in depth how it works. So we will review in the next pages the functionnalities of this unit, its hidden mechanims as well as the procedure to install it, to remove unwanted noises without to forget a critics of its performances in the field. How does the MFJ work ? The objective of this unit, we will call MFJ for short, is to reduce noise or interference (QRM) before they affect the circuits of your transceiver or receiver (that we will call RTX for short) to improve the quality of Q signals you want to listen to. The secret of the MFJ is as old as the world although its price relatively high seems more to be a marketing question : it combines signals from two antenna inputs and adjusting both phases and amplitude it gives you the opportunity to remove unwanted noise and even to enhance desired signals. The MFJ unit is optimized for HF bands between 160 - 10 m with an average bandwidth of about 40 kHz. Basically the phasing method which is at the heart of the system allows to cancel interferences that yield an intensity much stronger that the signal without affecting this latter. Due to this principle the MFJ is theoretically effective with all types of QRM (noise or interference) and all modes (SSB, AM, CW, FM, RTTY, SSTV, packet, pactor), and therefore should work whatever your aerial, wire, directive or array used. Once the unit is set accordingly your working conditions, any noise can be substracted from the bandwidth by pressing only one button, the PHASE. On paper the noise reduction can exceed 60 dB with a gain change as small as 1 dB, a value adjustable with the Phase control. MFJ conceptors highlight the fact that to work properly the unit must operate on signals that are the same on both inputs, the MAIN and AUXILIARY antennas. If the same noise is present on both inputs, it is nulled while a Q signal will be enhanced. Being given that some sources of RFI are not captured or audible on the internal whip antenna (this is the telescopic whip on top of the unit) in most cases it is necessary to plug an external antenna in the AUXILIARY ANTENNA input. This secundary antenna does not need to be as long as the main one but in order to remove distant RFI it should display the same polarization and the same direction to achieve the best result.